Cylindrical UFOs, spheres and disks. Huge globe, surrounded by fire, made whistling noise, flying at high velocity. Gave off heat. Globe exploded. Occupants wearing tight fitting clothing. William J. Kiehl . Its shape was that of a globe except that it was slightly flattened on top and had some sort of a square substructure around the bottom. Two "little fellows" were on this deck-like substructure, and appeared to be busy with a hose which looked to be about two and a half inches in diameter. The hose was green and on the end of it was a round object. While sailing off the coast of Nicaragua, he and his boat's captain saw a bright green-and-blue sphere which approached the observers until it was the apparent size of a plate. Sanderson, Ivan Terence. The glowing spheres and disks, ranging in size from one-to-five in diameter, sometimes exhibiting changes in color, usually from orange to red to white and back to orange. Rare daylight sightings revealed globes with a metallic finish. Sometimes flying in formation. Foo Fighters. This photograph was taken by a plane film crew during World War II. The three white unknowns are part of the legendary "foo fighters." Coral E. Lorenzen . On June 10, 1947, four years after she married Jim Lorenzen, who woul be her partner at APRO, she saw another UFO. This was a small sphere that rose from the ground near Douglas, Arizona, and disappeared into the night sky. Bruno Facchini. "Then I saw there a huge dark shape, like a ball, with a flattened top." CAA [later FAA] spotted a round, shiny object. Marine fighter pilot and Air Force would attempt an intercept. Jets from Langley Air Force Base in Virginia tried still another intercept. "Probable balloon" Lieutenant Edward Rupplet. Through binoculars, these objects were distinguishable as red spheres, circled by yellow rings inclined at an angle in such a way that the bases of the spheres were were almost completely hidden. Luminous sphere. Clare Booth Luce and others. The UFO was circular, had a large base and smaller upper deck. Two pairs of legs protruded from the base. Ocassionally, a thin shaft of blue light shone upward from the center of the deck at an angle of forty-five degrees. The machine and its occupants were surrounded by a glowing halo of light. One round object intercepted a long object and either attached itself to the latter or disappeared. He was held frozen in his tracks as he watched a glowing object cavort in his backyard and then streak away. Puzzled authorities found a burned spot about the size of a dinner plate in the grass. A pilot had seen a round, glowing object near the Northern Hemispsere's largest power plant at Niagara Falls. Blackouts. Spherical UFO was seen hovering over Clay power substation in Syracuse, New York. Blackouts. IMAGE: Claude Pavy of GEPAN (the offical French UFO study program) in 1967, with the two children at the site of the encounter. Francois Delpeuch (13) and his sister Anne-Marie (9). Details of the object are scanty. It was a perfect sphere, about 2 metres in diameter, of a very brilliant luminous silver colour, and dazzling. Francois, who wears spectacles and so must have sensitive eyes, experienced running eyes for a quarter of an hour after seeing the object, and every morning on waking for several days afterwards. His sister, who does not wear glasses, felt nothing. No details were noticed on the sphere itself; it was perfectly smooth, without marking or visible opening. Round object with a white light in its center and red and blue lights around its edge. It was surrounded by a glow or halo. Going beep, beep as it went. Lyndia Morel. She described the object, now, as an orange-and-gold globe completely covered with a honeycomb design of hexagons except for an oval window of paler color situated on the upper left portion of the UFO. A quick glance, followed by an astonished stare, revealed its source: a dark, round object with vertical, brilliantly lit windows. Half triangle, half round object, follows man in his car. Object causes vehicle interference and physical effects on driver. February 7, 1976. Farmersville, Indiana. A little later, just south of his son's trailer, there was a round object. "It was darker green than the rectangular thing and looked like it was right in the fence row. This one looked like it might have been eight or ten feet in diameter and on, or very near, the ground. It changed color from pale green to bright blue and back to pale green. When the larger rectangular object got over in the area back of the trailer and a little south, the smaller sphere moved up to the bottom of the big object and went out like a light." The single remaining object then departed slowly to the east. Large round light emits a beam to the ground. Multiple witnesses. Translucent, spherical, Saturn-like object with sparkling lights inside, is observed by a retired civil engineer. Source: Randles and Hough, 1994. Bob Taylor. Bob Taylor describes how he stared in amazement as two metal spheres with spikes on, not unlike sea mines, emerged from the rear of the object and bounced towards him. they made horrible, sucking noises as they impacted into the wet soil. as they reached his side he became aware of a curious acrid smell, then felt a tugging on his legs and collapsed unconscious on to the ground. Danny Gordon. Roger Hall. It was very large, had a dome shape to the top of it, no wings, and what appeared to be strobe putting out multi-colored lights on the right side of the craft. Estimated size two football fields in diameter. Three huge picture windows in the back of it that were lit inside out. A red ball docked with the craft. "They drew classical shapes, as you can see. A sphere or a disc, resting on four legs. And indeed we found imprints in the ground," pointed out Dr. Yuri Lozovtsev. Goat herder, Flores de Mamani. The sphere was described as shiny and silvery with several multi-colored lights around it. A luminous globe shaped craft landed in a wooded area near a police station. Four humanoids emerged from the object. These were described as 1.45 meters in height, very large heads, as in proportion to their bodies, short arms, and huge staring eyes. They wore tight fitting metallic objects. The humanoids collected ground samples and vegetation and then re-entered the object, which took off at high speed. Jennifer Biels, Richard Grayson, and Todd Phillips. 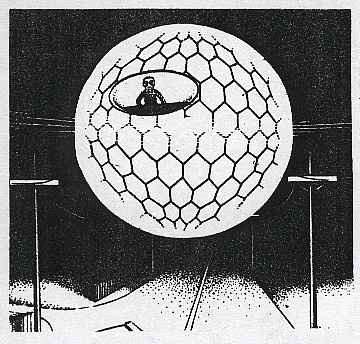 Looking up, they saw a large glowing sphere eighty feet in diameter, surrounded by three smaller triangle shaped objects. Two observers watched a luminous greenish sphere land nearby them. Seeing a trio of luminous spheres which merged to form "a pair of saucers on top of each other" before vanishing. Odete Fortini was standing in the verandah of her house when she observed a sphere of light approach and land about 200 meters from her location. As the light dimmed she could see that it was a round object with a cupola on top and several small windows around its edge. Translation: August 9, 2010 meung on the Loire A10 direction Paris France on August 9, 2010 00:15 on l' motorway A10 Paris direction, kilometer 114 While returning from micro holidays with Royan, I came to deposit hitch-hikers at exit 15 and j' stays spirit to take again my cruising speed on the way of right-hand side. I n' stays not tired because j' the day before, I had slept very well m' stays raised with 10:30, and j' had drunk a quill d' " energy drink" before leaving 4:00 earlier. My daughter slept with l' back, the music played, my girlfriend spoke to me before falling asleep again and all the lights were extinct in the car. Suddenly and during 2 seconds, j' saw a ball with the top of l' motorway with approximately 400m in front. C' is thanks to fires of the car which passed in lower part at this time that I l' saw because it n' no light emitted. J' thus believed that c' was an inflated balloon with l' helium or an object which fell on the road and that m' made fear, but I n' did not slow down. Once the car which m' this ball had revealed had passed, l' m' object; because the road n' was invisible; is not enlightened at this place. Approximately 8 seconds later, these are the fires which lit l' object and j' could l' to observe during 2 seconds again, but of close this time, and jusqu' with the vertical passage thanks to the Visio windshield of my " large C4 Picasso" , and with fires of the car which ran behind. C' was a ball d' approximately 1m50 of diameter, with 2m with the top of me, d' brushed metal aspect, of gray and quasi stationary color; I say that because it m' seemed qu' it moved very gently towards my line during the time of my 2nd observation. 10 minutes after I started to seek the number of the gendarmerie nearest to inform them of the presence to this object because it m' seemed qu' it was low enough for qu' heavy lorries can type it (low than the bridges which overhang l' motorway). I am conscious that made think of the balls on the cables with high voltage (aspect, size, color…) but at this place it n' there did not have and in my opinion c' was well too low to correspond.